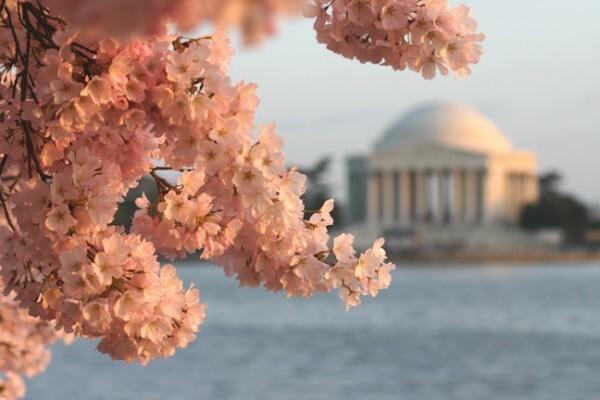 It is Cherry Blossom Festival time once again and visiting your favorite Washington, D.C. bed and breakfast could get you a look at the most exquisite and historical blooms. The blooms are reported to peak around April 3rd to April 6th. Just over a century ago, the mayor of Tokyo gifted 3,000 Yoshino cherry trees to the city of Washington, D.C. What began as a collaborative friendship between two countries to ensure that the trees arrived safely and thrived over the years has blossomed into a lasting and close relationship between the U.S. and Japan. Even through harsh and difficult times, the cherry blossom trees are a symbol of the ties that bind our countries together. Interestingly, a few years the gift of cherry trees, the U.S. gave Japan dogwood trees and many years later, in 1981, the U.S. gave Japan some cuttings from those first cherry trees to replace trees in Japan, destroyed by a natural disaster. Each year more than a million people visit our nation's capitol to witness The National Cherry Blossom Festival which celebrates the rebirth of spring as well as the delicate and treasured friendship between Japan and the U.S. The five week festival that runs from March 20th through April 13th includes a reenactment of the original planting of the trees by school children, kite festival boat tours on the Potomac River, a display of Japanese Art, a Tidal Basin tour of the trees, bike tours, photography tours and the festival is closed with the National Cherry Blossom Festival Parade. 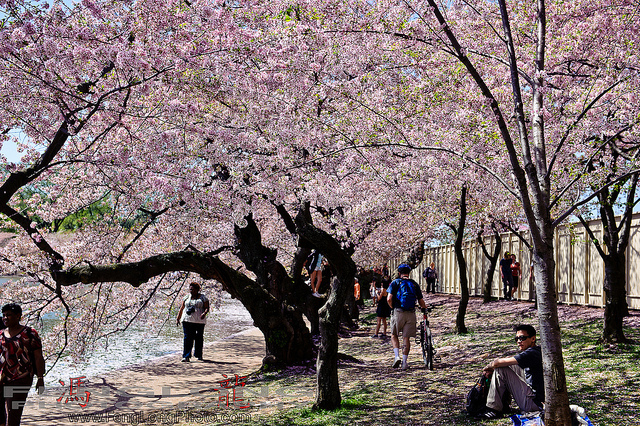 Have you attended the Cherry Blossom Festival? Share your experience with us at Facebook! One of the newer events to be added to the five week festival, the Blossom Kite Festival showcases some of the most unique and colorful kites from across the globe, as they fill the Washington, D.C. sky in celebration of the Cherry Blossom Festival. The Blossom Kite Festival hosts an activity station to make your own kite to fly, a kite competition and demonstration, and a Rokkaku Battle. 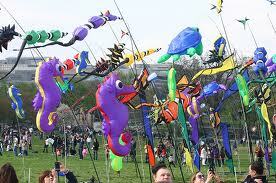 The Cherry Blossom Kite Festival will be held on Saturday, March 30th from 10am to 4:30pm on the Washington Monument grounds. Admission is Free to everyone! What would your kite look like? Tell us at Facebook! Visitors to the festival on April 6th will be treated to the official and spectacular fireworks display at the Southwest Waterfront. 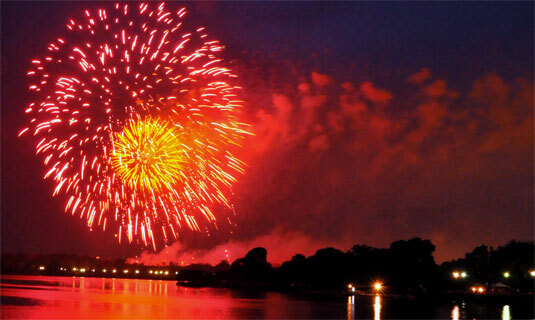 The festival begins at 1pm and goes until 9pm with fireworks starting at 8:30pm. Among the activities for Southwest Waterfront Fireworks Festival, a Very Cherry Marketplace featuring market vendors and artists. There will be live music, water activities, food, cultural activities and displays. Where is the prettiest firework show you've seen? Let us know on Facebook! The festival will be brought to a close with the National Cherry Blossom Festival Parade on Saturday, April 13 from 10am to 12noon. The parade will begin on Constitution Avenue at 7th street and continue to 17th street. 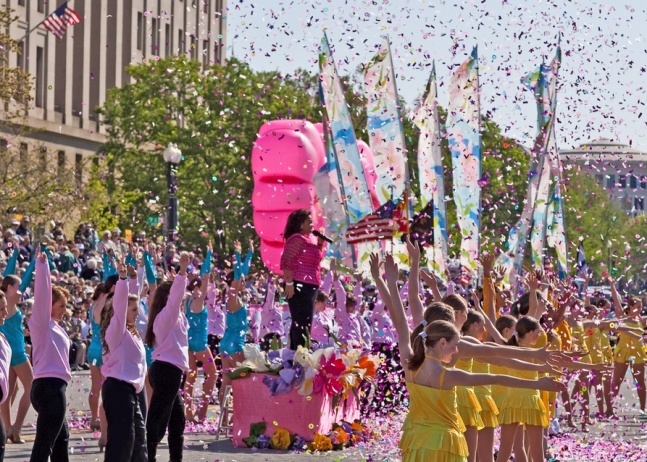 Spectators will view vibrant floats, marching bands from across the U.S., performers, and creative blossom inspired costumes and of course giant balloons! Admission is free along the parade route, with spectator grandstand seating for $20 per person. Would you like to visit Washington, D.C.? Tell us about it at Facebook!